After a recent query on running MySabre on a Mac I decided to give it a try. There are two basic steps to get Sabre running on any machine. Step one is the VPN connection. Step 2 is to get MySabre running. 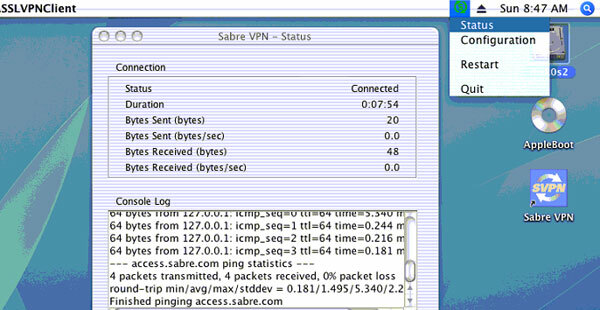 First I got a copy of the OSX version of Sabre’s VPN software. Not the easiest thing to find mind you. The install went smoothly and created a desktop shortcut to launch the VPN client. After login, the VPN status appears in the task bar above. Yes its the same green S you find on MS Windows. I ran a quick test to make sure the VPN was working by selecting the Status option and clicking the Test button in there. Notice the successful response from localhost (127.0.0.1). I’m gonna put up another post on how this so-called VPN seems to work! The VPN setup was way easier than I anticipated. Onto step 2. The web-interface for MySabre has never worked well on any browser other than IE. In Safari, beyond the login screen, nothing seemed to work at all. I’m going to keep at this and will post an update pretty soon. Now I’m determined to get a functional Sabre running on an Apple Mac under OSX. The sad part about all this is that there is no documentation on this anywhere. If you do find a link, post it in the comments. Part 2 of this experiment would be a successful query for air availability in OSX. 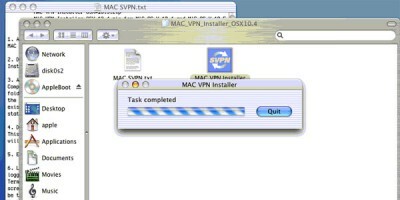 Where did you find the vpn installer for Mac? Hope you get it functional. Try using Firefox. I have gotten to the screen where the system tries to connect with Sabre and since I do not have the VPN connection for the Mac I cannot go any further. I did get it running on Firefox but it looks like crap! I’m working on an update to my Sabre POS utility and that looks much better! Will post about it tomorrow along with a link to download the VPN! 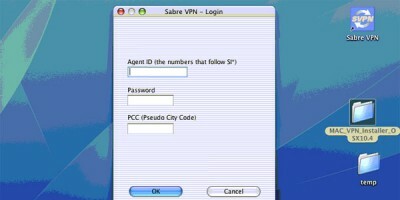 kindly i need to know how can i install sabre vpn for apple mac ver 10.5.7 ? I USED THE VPN INSTALLER ON 10.5.7 AND IT IS WORKING FINE. SO FAR I HAVE BEEN ABLE TO CONNECT USING FIREFOX WITH SOME CAVEATS BUT FOR ME IT WORKS JUST FINE. HOW DID YOU GET A HOLD OF THIS INSTALLER? LET ME TELL YOU, YOU ARE A GODSEND. THANKS FOR YOUR ADVISE. Hi, I am a mac & sabre user. I was using paralles+Vista then Sabre. Too much time to open Sabre Blue screen. I have contacted Sabre tech support for every 6 months to see if they started to support Safari. Today I got an email and they gave me a command for Mac OS. However I could not go. I need your help. Thank you for your email. I’m glad to tell you that MySabre, as a Java application, will actually run on Macs, on Safari, namely. Only SVPN module needed to be adjusted for Mac and so has been done already. 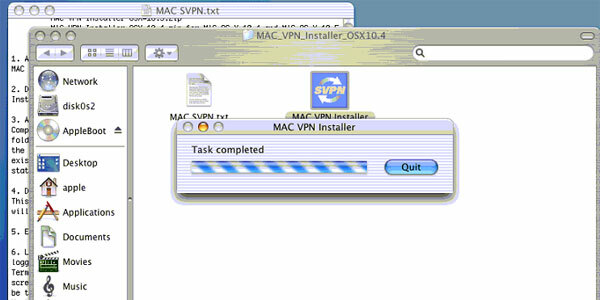 Please [click here] for your MAC version of SVPN. Please bear in mind, though, that you will need a Mac-aware tech on your side for its installation as our help desk is specialized in Windows OS. Our support for Macs is very limited to our own experience hence we can not always provide an answer to the Support Requests. I got a folder and files for Mac. This is “Read me first” text. Could you tell me how to do this? In order to find “hosts”, I did Shift+Command+G key then move to “etc”. I gave permission to the file or move “hosts” file to desk top (usually Host file became writable) but I could not. FORMAT entries on a MAC are made from the terminal application on the MAC. FORMAT = tar xvf sabrevpn_prod.tar. and add to your /etc/hosts file. It is recommended you reboot or flush DNS at this point. Be sure to use 10.5 if you are going to put work into this! 10.4 is old, obviously, and there were a lot of changes in 10.5 (not to mention 10.6 is right around the corner). My friend works at a travel agency, and they would love to switch the office to Macs. Downloaded 10.6 and having same problem as Richard. Would love a work around! Posting this here since it’s the top search result on Google. 1. Need to enable Java run in 32 bit mode. Go to Applications–>Utilities–>Java Preferences.app and change both plugin and applications to 32 bit. Adam, I have tried to download the pdf file you posted but it has expired. Can you repost it, please. Sure thing, I guess the yousendit.com link expired. Thanks, Adam. I got it working using Safari instead of Firefox. Looks better and all functions work. Adam, could you post a link again? The file is gone. Why can’t Sabre just offer support directly? It’s crazy people have to go around the bush like this! Hopefully they’ll stay good for a couple months. I had this working perfectly on Safari for the past few months but all of a suden it no longer works. I can’t get the VPN to connect. Every time I try to log in I get the sign in failed screen and it asks me to try again or to reset my password. Any ideas? Im running snow leopard and I’ve followed your instructions perfectly and I still can’t get the VPN to connect. Help, I really don’t want to go back to parallels! I don’t think we ever got this to work on Safari, just Firefox as SABRE recommends. The person I corresponded with at SABRE was Brad Johnson, I’d give him a try. Brad’s email: vrack at sabre dot com. Thanks for re-hosting this file came in very handy for me this morning. I have been trying to conenct using firefox (OS 10.6) and followed all the instrauctions as per the PDF. I have come accross the same error as Luis, the Sabre VPN won’t take my password and suggets i may need to change it, whuch i also tried donig with no luck. I have e-mail Brad Johnson and will let you know what response i get from him. I’ve seen some of my older helpdesk docs floating around online that link to dead or outdated files so I would ensure you are on the latest and greatest. I will qualify this by saying that we are fighting a problem with MAC SVPN users now where the launch of the SVPN gets an authentication fail as if you input the wrong password. There is nothing wrong with the password and you’ll find that any other login will work to authenticate the SVPN client and your normal user/pass will work for MySabre. I’m working with the development teams and hope to get this squashed soon. If you can’t get past this give the helpdesk a shout and the team should be able to get you in. They might ask for some data too that will help me in my case with development. If you ever get any resistance from the technical helpdesks with MAC support or some blank stares ask them to get with the 2nd levels. They should know how to get around these issues or come to me and my guys for live help. I need to run mySabre on Mac OS 10.5.8 + Safari or firefox. Anyone please let me know which installer. If 10.6 is much better for mySabre, I will consider upgrading OS to 10.6 near future but I want know for 10.5 for today. mySabre was working on my safari 4.0.4 on Oac 10.5.8 successfully after I download following files. Now … Anyone successfully print Itineraries from Mac? Now, Sabre is supporting Mac OS. Good thing to me. Hello guys. I was able to install and get the Sabre bluescreen asking for the login on my Mac 10.6.3, the issue now is that I can’t get my keyboard to work…..do you hv any ideas? Wow, just when I was thinking I was condemned to Sabre Windows I find this blog. Thanks, everyone, for working on this and making the info available. I tried all the earlier links and they have been taken down. EJGG’s link from 3/24 worked though, and I installed the VPN for Mac client. I logged in on Chrome but it stalled on installation. I went back to the instructions which seemed to say to log in again on Safari, which I did. I clicked on Start Manually and the Runtime for Java downloaded & I installed it. Still nothing, but I get the Console Log. I tried Test and it showed that the connection was good but the LMHosts file is “not” OK. I’m assuming that’s because it’s either missing, out of date, or Windows. Sabre Support is closed for the holiday. What should I try next? 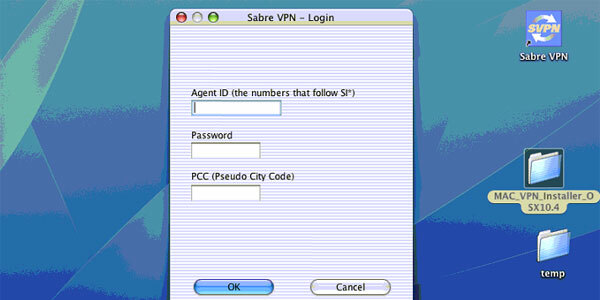 Jimbo, after installing Sabre VPN a blue square SVPN icon should appear on your desktop. Click it and it will ask for a password. Enter here the password for your mac user and press OK. The next window will ask for your agent ID, sabre password and PCC. Press OK. A logo will appear in the menu bar. Green means you are connected. Now open Safari and go to https://my.sabre.com. Log in. On the next page when it tries to connect automatically to SVPN click cancel. This will bring you to the next page that states it was not possible to connect to Sabre VPN. Click the link that says continue to MySabre once Sabre VPN has connected. This should get you in. I’ve gotta try it out on the Mac myself. Sabre Red has been running on my windows 7 laptop for a while now. Does it give you an installer to download? I been successfully work MySabre on my Mac 10.5.8 and Safari 5 because of your help. Sabre Red sounds mandatory upgrade. I really really want to work on Mac&Safari. What should I do? Anyone successfully install on Mac? I got following email from my host agency. You have been scheduled to upgrade to the new Sabre Red during the week of Sept. 26. During the week of Sept 26, when you log in to MySabre, you’ll be prompted through the simple download process. You may defer activating and completing your upgrade for up to 14 days from your initial upgrade date. Note—the upgrade prompts will be turned on in batches throughout the week, so you might be prompted Tuesday, the 28th, or as late in the week as Friday, October 1st. The update takes just a few minutes and pulls all your MySabre information in automatically. If you have questions that are not answered here, please check out the Sabre Red community in eServices. Also we have started adding Sabre Red documentation in the GDS tab in WebView. We will be adding more documentation soon. For download assistance, please contact the Sabre Hardware Support desk at 1-866-334-7551 option 5. Hi guys, no problems with working via windows for sabre red, however no installer for the mac. I cant understand that many people world wide would be working with macs and sabre dont have a platform for a mac !! Please if anyone finds a solution let me know. We’ve been upgraded to Sabre Red and the only work around I have on my Mac is using Parallels and windows xp. Works very well, but I’d rather not have to load up windows every time. On a different but similar topic, has anyone ever succeeded in running a ticket printer from a Mac? I assume we need the printing module, but that seems to be a windows only application. Do you know how to install the SABRE RED in Mac? any news to install red on mac? Does anyone know if there is any sabre red app for iPad ?? So, with the mac vpn can I run on OSX 10.4 without bootcamp or another partition? I have installed Sabre Red on MAC. It started but does not fully load. Help me..